Our Chicago City Flag is ubiquitous. It seems it is everywhere, on municipal buildings, arenas, lampposts, banks, police and firefighter uniforms, everywhere. But do we know our flag’s meaning? Those stars must be there for a reason. And the stripes, are they more than mere decoration? 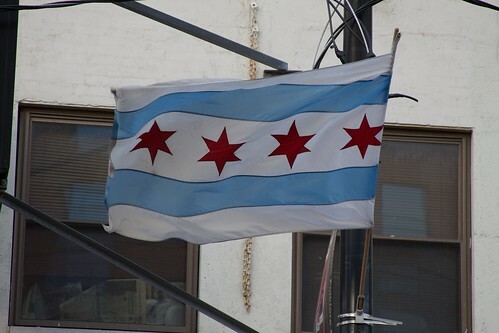 The Chicago Flag has four stars. What do the stars represent? Do the blue stripes represent anything? And if so, what do they stand for? Worth 15 points. Which star was added most recently? Be careful, this could be a trick. Worth 25 points. 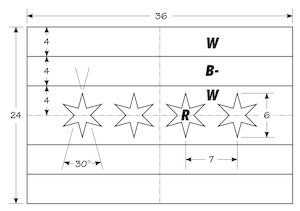 And finally, for you trivia buffs out there, what does each point on each star represent? Worth 11.5 points. To enter, include your answers as a comment below. I’ll announce the results in a couple of weeks. Good luck everybody. And keep your eyes on your own computer. This entry was posted on Monday, June 4th, 2012 at 10:10 pm	and tagged with Chicago, Chicago Flag, Michigan Avenue, Star and posted in Chicago History. You can follow any responses to this entry through the RSS 2.0 feed. I think the blue stripes represent the North and South branches of the river. The four stars are the fire, 1895 Exposition, 1933 world’s Fair, and Fort Dearborn. I am going to guess that Fort Dearborn was added last. I have no idea what the points of the stars represent! ……..for your answers for the Puzzler! All will be revealed in a week or so.